Pothashang News Service: Imphal, March 12, 2018: Chief minister Nongthombam Biren Singh today assured the people to deliver quality of life to the people while he inaugurates Primary Health Centre building, Kairang and PHSC Building, Laipham Khunou held at Primary Health sub-centre, Laipham Khunou, Imphal East. Biren Singh said the state has been experiencing some positive change and the government is focusing to uplift the socio-economic status of the needy and poor people living in the state. After the government launched new welfare and health schemes for disabled persons and needy people of the state, the number of grievances on Meeyamgi Numit and Hill leaders’ Day has been reduced drastically and it is a sign of positive change in the state, he added. The feedbacks gathered from the Meeyamgi Numit and Hill leaders’ day have contributed a lot in solving the grievances and problems faced by the people. The present government is providing soft loans/financial assistance to the unemployed and needy people of the State, he added. 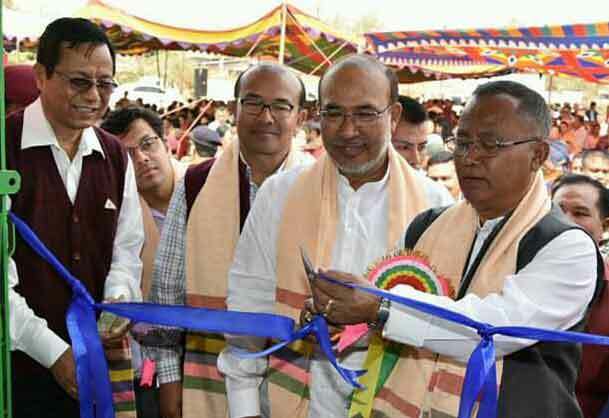 Biren Singh said the newly born Heath Care Scheme “Chief Minister-gi Hakshelgi Tengbang (CHMT) has got excellence National Award recently. Around a population of 15 lakhs would be covered under the new Health Scheme, he said. At the national level, under the leadership of Prime Minister Narendra Modi a new national health insurance scheme would be launched soon. He said CHMT is committed to provide health ‘assurance’ and not ‘insurance’ to the poor and needy people of the State. He assured t a new educational scheme for the children of financially weak families of the state will be launched by March 15. Under the new scheme, the government will bear all the expenses on books, admission fees and uniform etc. for poor students, he added. The government has already waged ‘war against drugs’ and mass destruction of illegal cultivation of poppy plants has been started. He said that in order to have permanent solution for flash floods during the monsoon season, dredging and cleaning work of river beds have been started. He appreciated the efforts and voluntary participation of the people on the eviction process of all encroachment at river banks. Biren Singh said the government has already begun the month long celebration to commemorate the first anniversary of the BJP-led government in the state. The first 15 days would be celebrated as “Inauguration Fortnight” and the government would be laying foundation stones for various projects in the last 15 days of the month. On the occasion minister for health and family welfare L. Jayantakumar Singh reacted on the mockery by the Congress legislatures for ‘inaugurating the projects taken up by the previous government’ and ‘attempt to incomplete projects’. Jayantakumar said they are doing cheap politics. “If we keep on blaming each other, both will be hurt”, he added. “I can also say they stopped construction they had started as they could not complete them”, “We have completed them as we have power and what will be their reply to this”, he added. He asked the politicians to stop ‘childish’, baseless and illogical arguments to the government. He said the government welcomes every creative and positive suggestion from various sections of the society for the development of the state. He appealed the people to think health centres as their own property and to maintain it properly. He maintained that as per the norms, doctors aren’t supposed to be posted at PHCs however the government would try to depute a doctor at the sub-centre. As the population of the state is on the rise we need to have more PHCs and health care centres across the state, he added.